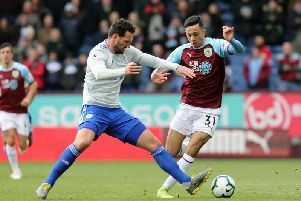 After falling victim to late goals against Swansea City, Hull City and Arsenal, the Clarets finally had the rub of the green as they left it late to beat Everton 2-1 at Turf Moor. The hosts had taken the lead through Sam Vokes's first half strike only to be pegged back by Yannick Bolasie's thunderbolt after the break. And, with the fixture seemingly heading for a draw, Scott Arfield struck in the final minute to spark wild celebrations. Dutchman Maarten Stekelenburg was the hero at the Etihad last weekend, saving penalties from Sergio Aguero and Kevin De Bruyne to secure a point for the Toffees against Manchester City. However, the goalkeeper's contribution to the opening goal at Turf Moor will be questionned after he left Vokes with a tap in to give the Clarets the advantage at the interval. The hosts had barely threatened Ronald Koeman's men in the opening 45 minutes while the hosts were reliant on another impressive display from skipper Tom Heaton. The England international's first involvement arrived in the opening minute after confusion inside the Burnley box presented Kevin Mirallas with an opportunity to score but Heaton stood up to the test of the Belgium international and beat the effort to safety. Smelling blood, the visitors continued to force the initiative though summer signing Bolasie was well wide of the mark with an acrobatic attempt from inside the penalty area. Burnley's first attempt at goal arrived shortly after when Johann Berg Gudmundsson's corner travelled all the way through to Michael Kightly but the winger, making his first start of the season, failed to get his foot over the ball as he hooked over. Everton were seeing plenty of the ball, they were slick in possession, but everything was played out in front of the hosts as they failed to penetrate. The Clarets, though, were guilty of standing off the away side at times and Romelu Lukaku almost capitalised. With space ahead, and nothing blocking his view of goal, the prolific forward let fly from 20 yards out but Heaton was equal to the shot. Heaton had been in stunning form in the 3-1 loss against Southampton at St Mary's and he played a leading role in keeping the Clarets in the game against the Toffees. Ross Barkley worked a shooting position when stepping past Gudmundsson inside the box and the midfielder hit the target with a rasping drive having wrapped his right boot around the ball. However, Heaton came out on top again. The visitors did manage to get in behind on one occasion in the first half when Lukaku squeezed goal side of Ben Mee from Gareth Barry's pass, only for the defender to make a remarkable recovering challenge. The Clarets had only registered one shot on target in the build up to their opener, with Vokes failing to trouble Stekelenburg from the edge of the box, but they made their second count in the 39th minute. It all came from Gudmundsson's exquisite flick in to Arfield though they were given a helping hand by Stekelenburg. The goalkeeper misjudged the Canadian international's effort, that had taken a wicked nick off the toe of Ashley Williams, and parried the ball in to the path of Vokes who snapped up the invitation from close range. After the break, Everton pressed for the equaliser and they didn't have long to wait to get it. Beforehand, Heaton had plunged to his right hand side to thwart Barkley at the foot of his right hand post while Lukaku failed to connect with Mirallas's cross at full stretch at the back post. But, just before the hour, their persistance paid off. Mee failed to cut out Barry's pass when stepping up, Lukaku took a touch and Bolasie rifled the ball across Heaton and in to the far corner. Again, Everton dominated the ball but failed to stamp their mark. Michael Keane applied a crucial touch to take Seamus Coleman's incisive pass off the toes of Lukaku and Heaton turned Bolasie's bending effort over the bar. And they were eventually punished. In the last minute, with the final throw of the dice, the Clarets snatched all three points. Keane fought to keep the attack alive from Heaton's set-piece, Gudmundsson's beautiful effort bounced back off the bar and Arfield made no mistake with the rebound, arrowing his volley past a static Stekelenburg and in to the corner.